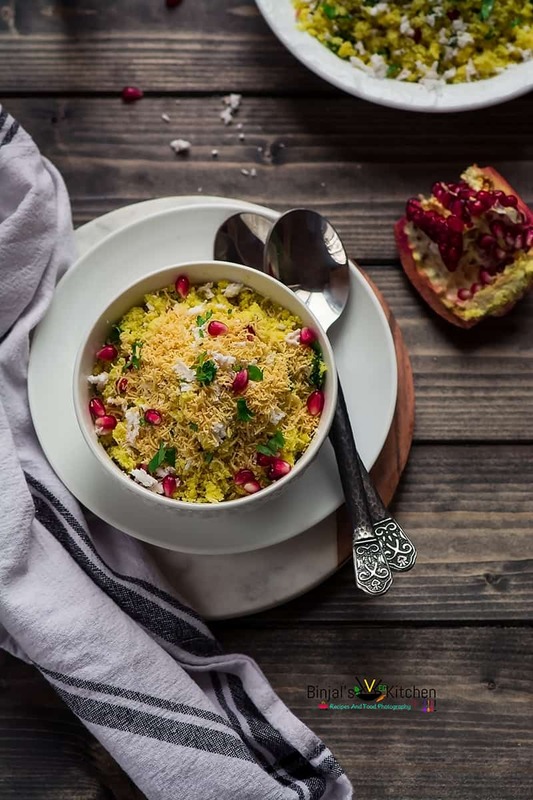 Our guest post series continues, with the talented Indian food blogger Binjal Pandya from Binjal’s Veg Kitchen! 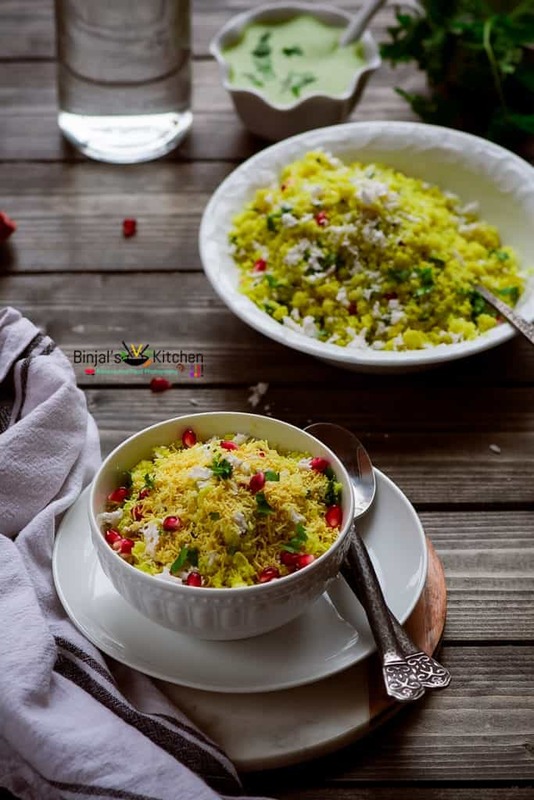 I have long been a fan of Binjal’s great recipes and beautiful photos. And I must say she is among those bloggers who define new artistic perspective of the conventional Indian cuisine with their photographs. While I was compiling the list of guest bloggers for the year 2017 she was the first one to make it to the list. I regularly find myself getting inspired by lots and lots of her recipes, so I know that you’ll enjoy this one! Even more than that, I just completely love being able to call Binjal a friend. And don’t miss out our collection of guest posts on Pinterest. Binjal says, “A warm hello to the readers of Fun Food and Frolic. Firstly, thanks to Hina for inviting me to share the guest post on her blog. Actually, we know each other as a food blogger through social media but never had the chance to meet in person or interact casually. Thanks to Instagram, our interaction grew beyond formal with appreciating each other’s work and sharing a word or two on insta story. I have always been a silent admirer of Hina’s blogging skills, she has such a wonderful blog. She is one of the few active bloggers who put their soul into each blog post, and it is evident from the photographs she clicks. So, when she extended an invite for the guest post, I could not refuse. I am delighted to share this traditional Gujarati recipe with her blog readers. Hope you all enjoy it!! Surti Sev Khamni, it is a popular savory street food from Surat in Gujarat. I have seen at many places, Amiri Sev Khaman is served as Sev Khamani, where khaman dhoklas are crushed and served with sev on top. Now you must be wondering, what is Amiri Sev Khaman? Actually, most of the people think, both are same but there are not. Being Gujarati, I have a chance of understanding the difference between these two dishes. Amiri Sev Khaman, is fluffy gram flour dhoklas, known as Khaman and sev is garnished on top of it. And Sev Khamani, is crushed chana dal, cooked by adding lots of ginger-garlic and green chilies, served with a topping of sev on it. 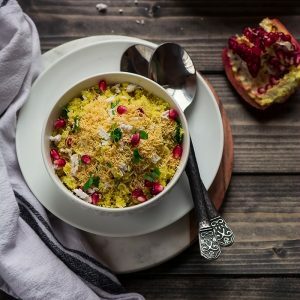 This Sev Khamani Recipe comes from my aunt, living in Surat and during one of our vacations with her I learned this recipe along with many other Gujarati dishes. Sev Khamani Recipe is a typical Gujarati snack from Surat region (that's why it's called surti sev khamani). Wash the chana dal and soak it for 5-6 hrs or overnight. Drain the water from the soaked chana dal and add it into the blender. Add ginger, green chilies and garlic into the blender. Blend all the ingredients together. While blending use less than ¼ cup of water to make the batter, do not make very fine paste. Now transfer the dal paste into a mixing bowl. Add sugar, salt, lemon salt, soda, turmeric, oil into the dal paste and mix well. Whisk the dal mixture using a spoon for 5 minutes or till the paste has a light and airy texture. Prepare your steamer ( buy it here ) to steam the khaman. Grease the steaming plate with a teaspoon of oil. Pour the prepared batter into the plate, then place the batter plate into the steamer and steam the khaman for 10-15 minutes. Remove the steamed khaman plate from the steamer and keep aside till it cools down. Cut the khuman into squares and crumble it using your fingers, into the mixing bowl. Spread finely chopped green chilies over the crumbled khaman. Now heat oil into a small pan. Once the oil is hot enough, add mustard seeds and a pinch of hing. Once seeds start crackling add 3 - 4 tbsp of water, sugar and salt, bring it to the boil. Pour this tempering over the crumbled khaman. 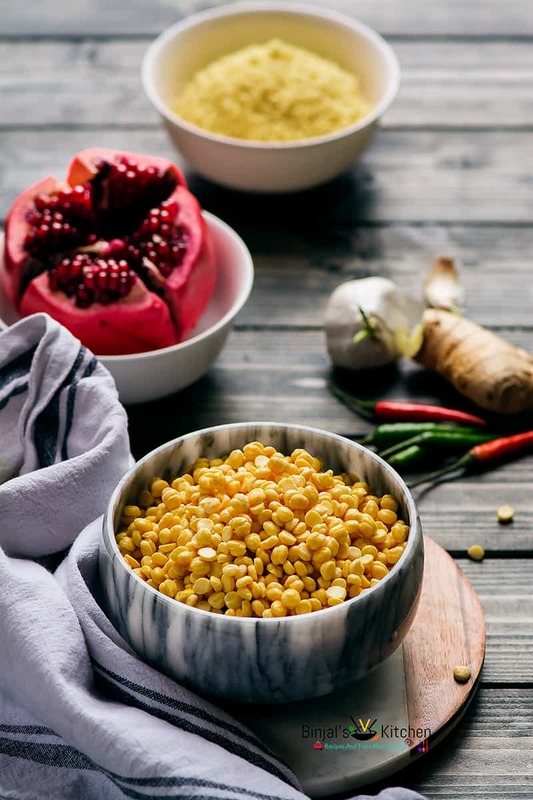 Sprinkle pomegranate, chopped coriander and grated coconut over the khaman and mix well. Surti Sev Khamani is now ready to be served. Just before serving add sev and mix nicely. Serve Surti Sev Khamani with green chutney ( see recipe ) for breakfast or tea-time snack. Adjust the amount of sugar and chili as per your taste preference. For the best crumbly texture of the khamani, let Khaman cool down completely, then crumble it. Also you can pass it through a broad sieve (gently rub your hand palms over the crumbs), do not use fine sieve.